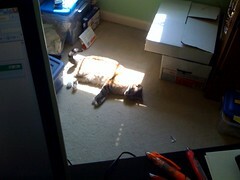 LOML* says that she's a solar-powered kitty. I say she's just happy I'm working from home this afternoon. Come on, Hope! It's 4:40 p.m. on Friday afternoon, and the only post that you've made since Monday is a picture of your kitty cat. I was hoping for something that would make me feel good on this Friday. Oh, well. There's always next week.